Garda is one of the main destinations of the Olive tree coast, the eastern coast of Lake Garda, overlooked by the reassuring presence of Mount Baldo. The town is rich in charm and history, and is inside an enchanting gulf close to Punta San Vigilio, Torri del Benaco, and Bardolino. The town of Garda owes its origins to a few stilts of the Italic civilisation whose traces were found in the area. It became a lively center during the Roman Empire, as various findings show us, like coins, tombstones, and sculptures. The name Garda is of longobard denomination, and it derives from the word “warda” (guard, lookout), a term that refers to the medieval castle that was built on the cliff behind the village. The town’s name later extended into naming the entire lake, that was previously known as Benàcus or Benàco. Thanks to archeological work a few walls of the medieval fortress were dug up, but the locals believe that the majority of the castle’s stones were used to build houses in Garda’s historical town center, that has always fascinated tourists. 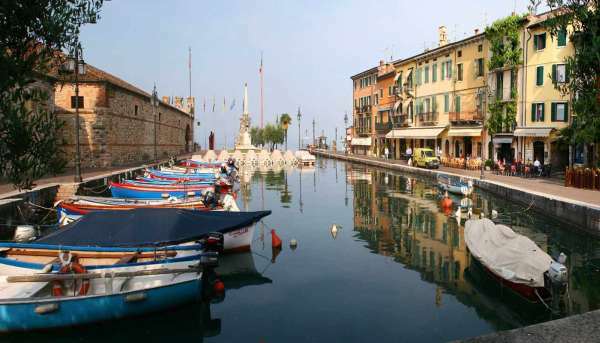 The Clock tower is the entrance to the medieval town center, where the beautiful Pieve del Garda deserves a visit. It is one of the most ancient of the area and was entirely rebuilt after the earthquake of 1117 and further renovated in 1824. The cloister and the vicar’s quarters are what remain of the original 15th century construction. The chapel dedicated to the Madonna della Pace (Virgin of Peace) has a 15th century fresco of the Virgin Mary and Baby Jesus, as well as other documents of historical importance. Garda has gothic and renaissance buildings and is rich in majestic villas like Palazzo Carlotti, Villa Albertini, Palazzo Fregoso, and the Captain Palace. This last one is on the town’s lakefront boardwalk and owes its name to being occasional residence of the Captain of Lake Garda, a magistrate representing the Republic of Venice. The town of Garda is 35km from Verona and in the gulf of Garda, that stretches north creating the fascinating Punta San Vigilio, who in its turn contains Mermaid Bay. Garda’s hinterlands are fabulous landscapes, an alternation between hills and vineyards that extend to the horizon. The area can be easily explored thanks to paths for pedestrians and bicycles, that lead to wine firms and and olive oil mills, where you can taste local products. Trekking lovers may reach the top of Mount Baldo (2.218m), also known as the botanical garden of Europe due to its prosperity and diversity in its flora. The panoramic gulf is dominated by the Eremo of Saint Giorgio, an antique monastery of Camaldolese Benedictine Monks, and the Rocca/cliff, cradle of one of the many legends of Lake Garda. According to popular tradition, a little before the year 1000 Queen Adelaide of Burgundy, victim of the cruel Berengario who killed her husband, was able to escape her imprisonment in the Rocca by reaching the southern coasts of the lake, and after crossing the swamps and forests of Lugana was able to find safety in Canossa, in Emilia Romagna. One of the most beloved and celebrated spots near Garda is Punta San Vigilio, whose name is derived from a monk who lived here in the 13th century. It is a small peninsula 3km north from Garda and houses villa Brenzoni Guarienti, a church dedicated to Saint Vigilio, a tavern, a small dock, and a park commonly known as Baia delle Sirene (Mermaid Bay). For centuries Punta San Vigilio has accommodated illustrious visitors, such as Tsar Alexander II, Winston Churchill, and Laurence Oliver, all of which were fascinated by this peaceful and romantic oasis. The park is made out of a big olive garden and offers the possibility of going for a refreshing swim in its crystal clear waters. Behind Punta San Vigilio is rocky spur covered in luxurious vegetation that proposes paths for walks. Nearby are prehistoric rock incisions. With its 24 million yearly visitors, Lake Garda is one of the main tourist destinations in Italy, greatly surpassing other destinations like Sardinia and Liguria. The town of Garda is one of the best equipped, tidiest, and cleanest on the lake, and offers great reception with its 60 hotels, apartments, restaurants, cellars, and Congressional Center. The main events are held during the summer, like the Bisse Regata or the Bisse Prize, a competition that dates back to the era of the Republic of Venice, where teams who represent different areas of the town compete against each other on Bisse, a traditional venetian rowing boat. Another water competition is the Assunta Prize, celebrated at night time on the 15th of August. The weekly market is on fridays, and it’s the best chance to hunt local products like fruit, cheese, delicious lake fish, handicraft and clothing.